Children's delighted faces as they pull up the carrots they had planted from seeds, neighbors working together to transform a vacant lot into a garden, mouth-watering vegetables just picked from the earth—these are what come to the minds of many when they think of community gardens. Such images will likely cause experienced gardeners to nod knowingly, having enjoyed both the work and the rewards of the garden, while the general public might smile benignly, having driven past a community garden or perhaps read a story about one in the local paper or a national magazine. When we see these colorful images and hear personal accounts of positive community gardening experiences, we understand why community gardens are generally liked and considered healthy expressions of civic life. It is not surprising, then, that people have organized to create places for people to garden in American cities since the 1890s. Looking back, we can trace a nearly continuous chain of community garden efforts. In the 1890s, social reformers started the trend by promoting vacant-lot cultivation associations to provide land and technical assistance to unemployed laborers in cities including Detroit, New York, and Philadelphia. At the same time, education reformers promoted school gardens as an interactive teaching venue that correlated with school subjects and taught civics and good work habits. School gardens grew into a national movement, with an office in the federal Bureau of Education devoted to school-garden promotion. The concurrent civic beautification movement motivated women's groups, garden clubs, civic organizations, and others to support vacant-lot gardens, children's gardens, window-box gardens in tenement districts, and garden contests. During World War I, millions of Americans planted backyard and community gardens as a way to augment the domestic food supply so that more could be sent overseas. Children's efforts coalesced through the federally sponsored U.S. School Garden Army. In response to the early stages of unemployment during the Great Depression of the 1930s, families applied to private, municipal, and state agencies for subsistence garden plots and jobs in cooperative gardens and farms. In 1934, over 23 million households participated in subsistence garden programs, growing produce for home consumption that was valued at $36 million. During World War II, households participated in the victory garden campaign to grow food for personal consumption, morale, and recreation. After the war, a few remaining school and community gardens provided continuity and inspiration for a rebirth in interest that occurred in the 1970s. Once again, gardens reappeared in neighborhoods, often built as acts of resistance to urban abandonment as well as to provide resources to address inflation, express a new environmental ethic, and reconnect neighbors during a time of social unrest. Today, myriad garden programs exist, including neighborhood community gardens, children's gardens, horticultural therapy gardens, and entrepreneurial job-training gardens. Some suggest that community gardens have an even longer history that dates back to the communal lands associated with American frontier towns. The picturesque town commons in New England that we see today started as practical communal land pasturage for sheep and cows as well as space for military drills, sports, and social events. Likewise, towns in the Southwest were laid out according to the Law of the Indies to include a central plaza and other publicly used land. These were practical and necessary spaces for subsistence, protection, and civic functions. Allotted at the time of settlement, the commons and the plazas evolved into parks such as Boston Commons and the plaza in Santa Fe. Community gardens, however, reflect a different type of land usage in that they tend to appear after initial development. Such spaces have rarely been planned as part of development but happen after the fact, often on deserted, derelict, or otherwise unused land. However, the need for such spaces has been both practical and appealing enough to compel citizens and institutions to initiate them. Although the contemporary city is no longer threatened with the same dangers as the frontier town was, garden advocates past and present consider urban gardens as "commons" because they are a communal resource to meet current needs associated with subsistence, protection, and civic functions. The phrase urban garden program encapsulates various cooperative enterprises that provide space and resources for urban dwellers to cultivate vegetables and flowers. While the term community garden is probably more familiar to many people and dates back to at least World War I, it tends to be associated with one particular manifestation—the neighborhood garden in which individuals have their own plots yet share in the garden's overall management. The broader category urban garden can include more types of programs, such as relief gardens, children's gardens, neighborhood gardens, entrepreneurial job-training gardens, horticultural therapy gardens, company gardens, demonstration gardens, and more. The term urban broadly refers to the city, its suburbs, and the urban edge. These are the contexts for most programs that have allotted land to people with limited access to gardening space, although some programs have extended into rural and low-density areas. The programmatic nature of many of these efforts needs to be stressed. While the idea of allotting land for gardening may seem straightforward, in fact much organization and program development is necessary. Most gardens rely on organizations and programs that coordinate gardeners, manage land, and facilitate educational or social activities. Hailed as a means to address a variety of concerns, urban garden programs have been established by individuals, philanthropic groups, educational and social reformers, civic improvement groups, governmental agencies, environmentalists, and others. Today, we generally assume that these garden projects are "grassroots" efforts, meaning that the programs develop locally with local, nonprofessional leadership. In truth, however, such ventures rely on a network of citywide, national, and even international sources for advisory, technical, financial, and political support. Quite often, the local, often voluntary leadership relies on staffed organizations and policies generated outside the community. Although various urban garden programs may share the same impetus—to bring people and land together to garden—they can take a variety of forms. Gardens might be located on institutional grounds, public land, or private land. Some programs focus solely on vegetable gardening, while others grow flowers, native plant habitats, or culturally significant plants for the purpose of teaching. Some programs provide land where individuals garden separately, while others set up a communal garden where everyone joins together and then splits the harvest. In most projects, participation is voluntary; however, some past programs required participation as part of the economic relief package provided by a charity or local relief agency. At times, gardening has been promoted as a national effort for all to participate in, such as the war gardens and victory gardens of World Wars I and II, respectively. At other times, garden programs have targeted specific groups, such as children, immigrants, or the poor. Even in these cases, people who may not be directly involved as gardeners still provide support through leadership, financial contributions, and land donations. It takes many people to nurture a garden, and many types of gardens to nurture individuals and community. The destructive forces of the neighborhood had been harnessed by so simple a thing as a garden patch, and made constructive. And a "sense of dignity of labor" had grown up in that of all most unlikely spots, that made the young gardeners willing and anxious to work for the general good as well as for themselves. SLUG's youth programs provide opportunities for teenagers to earn a paycheck, contribute to their communities, learn skills, and spend their free time productively and safely. Teens also discover a group to belong to, adult mentors to look up to, and a whole support network to turn to when they need help or guidance. Society has downplayed the importance of these opportunities and this support, choosing instead to pour resources into punishing youth once they have taken a wrong turn. Teens working at SLUG are building healthy futures for themselves and the city. This comparison does not mean program objectives have not changed over time; contemporary issues and local conditions shape each incarnation of the urban garden program. For instance, the paternalism that was acceptable in the early twentieth century is now replaced by goals of social justice. Tone and wording are not the only ways this is expressed. Whereas in the 1920s, middle-class women's clubs brought window boxes to tenements as a beautification gesture, today a garden organization's efforts at street beautification may include, along with window boxes and tree planting, local leadership development, lead abatement education, and youth training programs. Nevertheless, there are significant recurring themes. An important one is the use of gardening to reintroduce "nature" to the city. Urban garden programs provide a participatory experience that connects people living in cities, especially children, to the soil and plant and animal life. In some cases, the garden has served as a foil to the city by providing an avenue for the expression of agrarian values and ethics. At the start of the twentieth century, the urban garden was often viewed as a transitional space, an opportunity to teach immigrants and urban dwellers to love nature and therefore leave the city for the suburbs and country. In the 1930s, the garden was a testing ground for new ideas on how to integrate nature and the city, as in public housing or cooperative housing proposals that include community garden plots. This reconnection with nature is often associated with improving social and psychological health. Today, gardens are often described as oases of green in a concrete-dominated urban world. Thus, gardens appear in very urban places, such as Battery Park City in New York, where only a few people may have the opportunity to garden plots but many more can enjoy viewing them as passersby. In another context, a community garden plot can help recent immigrants with agricultural skills to transition into urban economies, as is the case at the Watts Growing Project in Los Angeles. Quite often, gardens include culturally significant reminders of agrarian traditions, such as scarecrows, sheds that look like red barns, or crops from gardeners' countries of origin. A second theme is the association of urban gardens with education. Through gardening, one learns not only practical skills associated with gardening—the steps necessary to nurture seed to fruit—but also the civic-mindedness to nurture a community open space. The connection of gardening to learning has been the impetus behind various attempts to integrate gardens into school grounds and academic curricula. Interest in school gardens swelled from the 1890s to 1920s, during the war- and victory-garden campaigns, and has recently regained popularity. For older children and adults, the educational capacity of gardening translates into job training. Through gardening, one learns how to work, and why. This conviction has been put to work in the relief gardens of the 1890s, the subsistence garden programs of the 1930s, and entrepreneurial training programs today. A project in 1911 to teach "backward or defective boys" through market-based urban farming is the precursor of current entrepreneurial gardens targeting "at-risk" populations. In some cases, the official purpose of a program might be to teach agriculture and gardening, but more likely the goal is to teach good work ethics that translate to many forms of employment. The tangible nature of gardening allows participants to see the rewards of one's labor, the benefits of teamwork, and the importance of commitment and patience. A third theme is the portrayal of gardens as a democratic space and gardening as an activity that brings diverse ethnic groups together in mutual self-interest. The urban garden offers an opportunity for families and neighbors to help themselves during war, depression, or civil unrest. During the world wars, the nation called upon its citizens to garden as an expression of their patriotism. The World War I campaign emphasized the dire need to produce food for households so farm-raised foods could be sent overseas, while the victory-garden campaign of World War II focused more on health, exercise, and morale than on food production for the war effort. During both wars, promotional material frequently praised community gardens as places where bosses and workers, husbands and wives, and people from varied ethnic backgrounds worked shoulder to shoulder. From the 1970s onward, the community garden movement supported a more localized camaraderie and morale. Faced with disinvestments and racial tensions, people got together to reclaim land and build food-bearing, social open spaces. These three themes—nature, education, and self-help—interweave according to the current social debates of the time. Given such broad ambitions, gardens are applied as solutions to address a range of concerns. Our gut instinct assures us that urban gardens are a means to counter urban congestion as well as depopulation, to improve education, to provide recreation, to ease labor relations, to curb social anomie, and to remedy environmental conditions. For example, school gardens appealed to turn-of-the-century reformers and educators as a way to improve education through manual training while also providing an entry point to teach immigrant families about civic duty, health and sanitation, and middle-class aesthetic values. Today, programs such as Philadelphia Green use gardening projects to nurture community participation, revitalize neglected neighborhood landscapes, and foster local entrepreneurship. The urban garden is rarely the end goal but rather facilitates agendas that reach beyond the scope of gardening. The many outcomes associated with gardens have also attracted support from various organizations, including beautification groups, charitable organizations, government agencies, environmental groups, and neighborhood associations. The up side of this fact is that it allows programs to draw on many interests and resources. The down side is that the high ideals associated with gardening rarely can be documented or verified. The tendency to layer multiple agendas on gardens makes achievable objectives difficult to ascertain, much less prove to a skeptical land developer or policy maker. The lack of clarity makes it possible for a garden to seem like an educational resource to one person and a regressive paternalistic institution to another. Urban garden programs persist as a small but pervasive strategy to improve American urban conditions. The public receives garden programs favorably, particularly at times of societal change, as a satisfyingly direct and tangible means for people to improve the local manifestations of larger social, environmental, or economic crises. Urban gardening has been and remains an appealing approach because it shows immediate results, is highly participatory, and is relatively cheap compared to other strategies, such as new housing, more jobs, or school reform. Even though urban gardens have had periods of broad popular support and receive the general goodwill of the public, they rarely have been considered permanent. Most urban garden programs throughout urban gardening's hundred-year history have been designed to be temporary. Situated on borrowed land and often relying on borrowed leadership for organizational and technical support, garden programs tend to seize immediate opportunities without asking for any assurance of permanence. Once the war, economic depression, or civic crisis fades, less attention is paid to continuing the garden program. As economic and social conditions stabilize, the garden site—usually donated—becomes more valuable for development of a different kind. While garden advocates typically contend that even in stable times there are individuals and families who need gardens as a resource for food, income, or education, the communal garden does not fit into general conceptions of progress. The demise of urban garden programs is generally a result of the public's benign neglect and is rarely contested, although some mourn the lost resource and plead for continuance. In localized cases, a garden might linger, such as some victory gardens that evolved into community gardens in the 1970s and still exist today, but this is the exception rather than the rule. With each crisis, programs have had to be reinvented, new land found, and new promotional campaigns developed to reiterate the economic, social, and personal benefits associated with gardening. This pattern profoundly impacts current garden programs, which generally intend to be permanent. Today, most advocates assert that gardens have a long-term function as open space that promotes nutrition, education, household income subsidy, recreation, and psychological and environmental restoration. However, this goal is impeded by difficulties in retaining urban land and securing funding for educational programs, staff, and outreach. Most gardens today exist on land that is donated or leased on short terms. According to a 1996 survey conducted by the American Community Gardening Association (ACGA), only 5.3 percent of gardens in thirty-eight cities were owned or in permanent land trust. Even a garden established on public land is likely to be considered temporary if the site is considered ideal for some new development. Lest the blame be put solely on land tenure, it is important to remember that public opinion and participation are also critical factors in garden sustainability. The ACGA survey also found that the two main reasons for the loss of gardens are lack of interest by the gardeners, followed by loss of land to a public agency or private owner. And yet, more gardens are built annually than are lost, so there is a gradual increase in number even while locations and participants might change. Considering the persistent development of urban garden programs and the current interest in them, a question arises: should urban gardens be part of the permanent infrastructure of the city? The repeated re-creation of gardens suggests that there is an ongoing demand for land in cities for gardening. However, the episodic appearances of past programs raises the question of why gardens did not "make the grade": why they did not become permanent so they would be available when they were needed later. Notably, from a historical perspective, the initial phases of urban garden promotion in the 1890s coincided with the development of another new type of urban land use, the playground. School gardens, playgrounds, and vacant-lot cultivation were frequently listed together as beautification and social reform projects that philanthropic groups could initiate, with the goal that the municipality would eventually claim responsibility for the project. Whereas playgrounds eventually become part of public park and recreation systems, urban gardens rarely received the same public sanction. Early playgrounds often included vegetable garden plots and peripheral ornamental plots. Today, most people acknowledge playgrounds as public services for recreation and child socialization, but they would be hard-pressed to articulate as clear and concise a definition of the function of urban garden programs. The urban garden's multifunctionality may be at once a blessing and an obstacle to its validation as a public, permanent resource. This book documents the history of urban garden programs and is organized around periods of national promotion. Part I describes the urban garden programs that developed in American cities during the formative years between 1890 and the First World War. Justified to serve distinct yet intertwined agendas—including education, assimilation, and beautification—garden programs of this era included vacant-lot cultivation associations, the school garden movement, and civic improvement gardening. Although these programs differed in audience and approach, they overlapped and blended together to become, in some advocates' thinking at the time, a "universal gardening movement." Part II describes gardening programs established to help resolve local manifestations of crises that impacted the entire nation. These include the war gardens of World War I, the subsistence and work-relief gardens of the 1930s depression, and the victory gardens of World War II. Patterns established in earlier decades—such as reliance on borrowed land, leadership being drawn from civic and women's clubs, and emphasis on children's programs—continued. Differences also emerged, including a shift away from growing food for sale and toward gardening to serve household nutritional needs, and a transition from gardening as occupational training toward gardening as recreation. While still a local effort, the garden projects that emerged in this era were shaped largely through top-down directives from national organizations and federal agencies. As these groups sought a broader participant pool than earlier programs, much more attention was given to ways of promoting gardening to the general public. Even as urban gardening was promoted, it was cast as a temporary effort that could solve an immediate crisis and then segue into recreational gardening, particularly in the suburbs. Part III attends to the promotion of gardening from the 1970s to the present. Although there was a general decline in urban garden activities after World War II, a few successful projects continued, becoming national models that inspired the renewed activism of the 1970s. Gardening became a venue for community organizing intended to counter inflation, environmental troubles and urban decline. While many of the same impulses that had spurred urban garden programs in the past—education, nutrition, beautification, and recreation—continued to be important, the garden also came to represent community empowerment and grassroots activism. This groundswell of interest was complemented by the formation of local and national organizations devoted to "community greening" in a broader social and physical sense. While the community garden movement has continued to grow and evolve, major concerns about participation and land tenure continue to haunt activists and organizers. 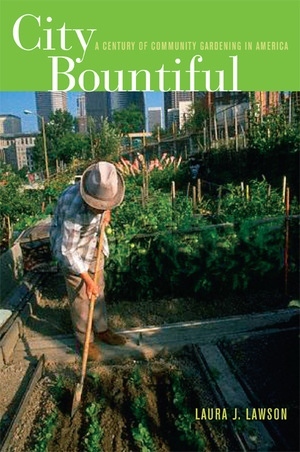 Along with a general overview of the evolution of community gardening since the 1970s, these chapters include descriptions of specific citywide organizations and programs. The final chapter describes contemporary urban gardens with goals that include community food security, job training, and education. City Bountiful explores each phase of urban communal gardening in light of its social, political, and environmental context. By examining the rationales for gardening used in promotional literature, one gets a sense of the key issues and underlying cultural assumptions surrounding gardening at the time. Highlighting organizational structure and day-to-day operations—who gardened, how they were supervised, how plots were allotted, methods of cultivation, and so on—is also instructive because such specifics reveal assumptions about participation, longevity, and outcomes. Whenever possible, quantifiable results are included, such as the number of participants or the value of food raised. However, these numbers come from promotional materials and rarely can be confirmed by other sources. The facts provided in this book are intended to illustrate broad issues that affected each locale in different ways. Cross-checking data was often impossible because of the limited availability of original sources and their tendency to emphasize positive outcomes rather than objective critique. Nevertheless, this broad overview will hopefully encourage urban historians, planners, and garden activists to dig deeper into the history of community gardening in specific cities around the nation. Since the 1890s, providing places for people to garden has been an inventive strategy to improve American urban conditions. There have been vacant-lot gardens, school gardens, Depression-era relief gardens, victory gardens, and community gardens—each representing a consistent impulse to return to gardening during times of social and economic change. In this critical history of community gardening in America, the most comprehensive review of the greening of urban communities to date, Laura J. Lawson documents the evolution of urban garden programs in the United States. Her vibrant narrative focuses on the values associated with gardening, the ebb and flow of campaigns during times of social and economic crisis, organizational strategies of these primarily volunteer campaigns, and the sustainability of current programs. Laura J. Lawson is Assistant Professor of Landscape Architecture at the University of Illinois, Urbana-Champaign. Her knowledge of community gardens has developed from academic interest as well as personal experience as coordinator of Berkeley Youth Alternatives' Community Garden Patch.